My first project today begins with this pretty simple little wood box with 2 Home Depot Stickers and a rope handle. I think I paid under $1 for this item at a garage sale. This little box may have been made by kids at a Home Depot event. First I removed the stickers and the rope, and washed down the box. Next I painted it with two coats of 285141 Rust-Oleum Ultra Matte Interior Chalked Paint 30 oz, Country Gray . 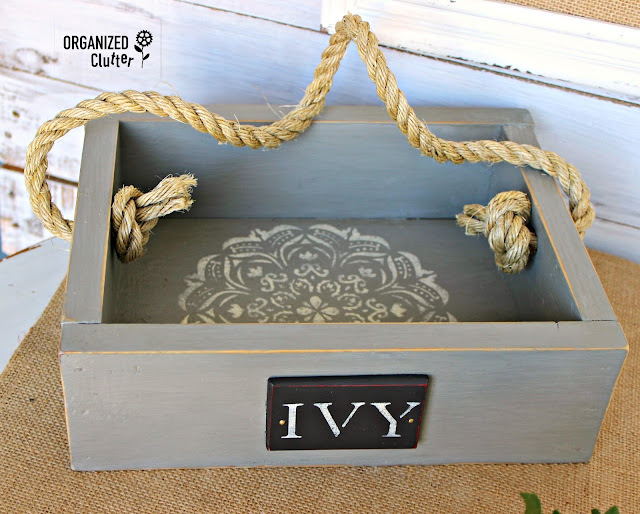 After painting the box, I stenciled a doily in the bottom with ivory craft paint and an inexpensive Show- Offs brand doily design stencil I purchased at Hobby Lobby. This is a little wooden refrigerator magnet I picked up at the thrift shop too. I spray painted it black with Rust-Oleum 302590 Chalked Spray Paint, 12 oz, Charcoal/Gray . 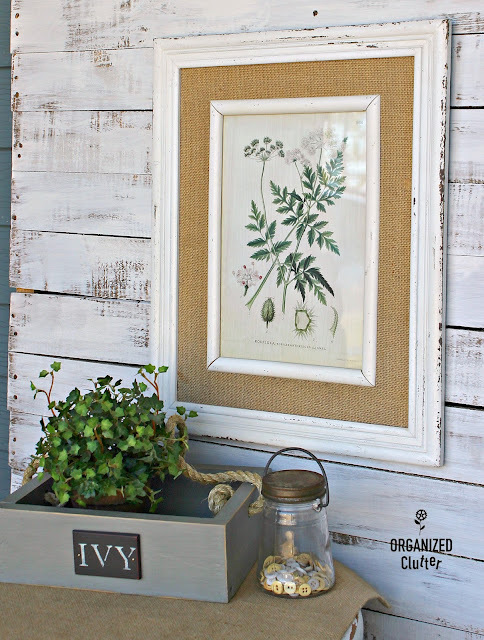 Then I stenciled on the word "IVY" with ivory craft paint and Darice Upper Case 1" Letter stencils. I purchased the letter stencils at a local craft shop for $2.99. The package included three different 1" fonts. I distressed the "Ivy" label, the doily stencil and the edges of the box with 220 and 100 grit sandpaper. Then I sealed the project with Varathane 262075 Half Pint Clear Matte Finish Soft Touch Polyurethane . This is water based poly for non-yellowing and easy clean up. I added T.W . Evans Cordage 23-605 1/2-Inch by 50-Feet Twisted Sisal Rope knotted on the inside top ends of the box. 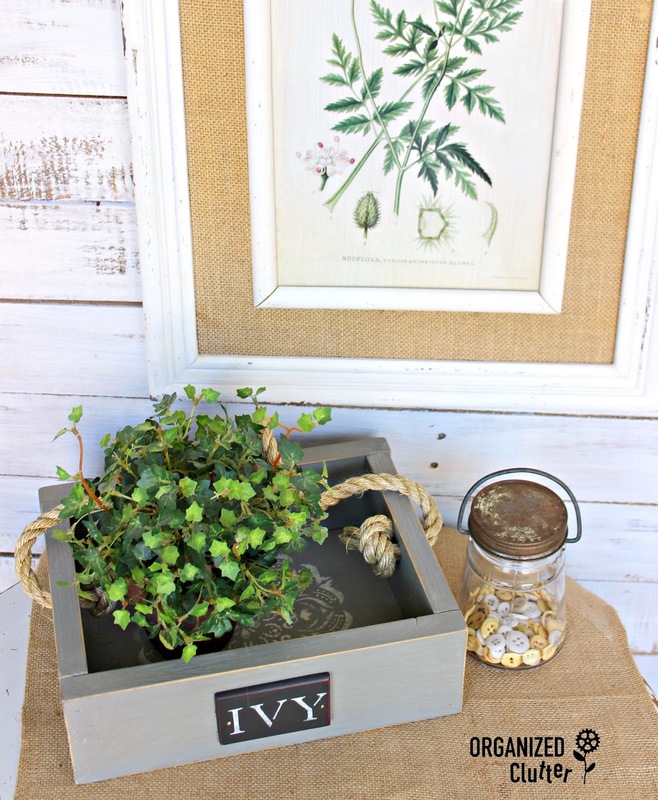 I added a faux potted ivy to my box. I think it's from Sullivan Floral and Gifts. I have had it for a while so it may not be available any longer. 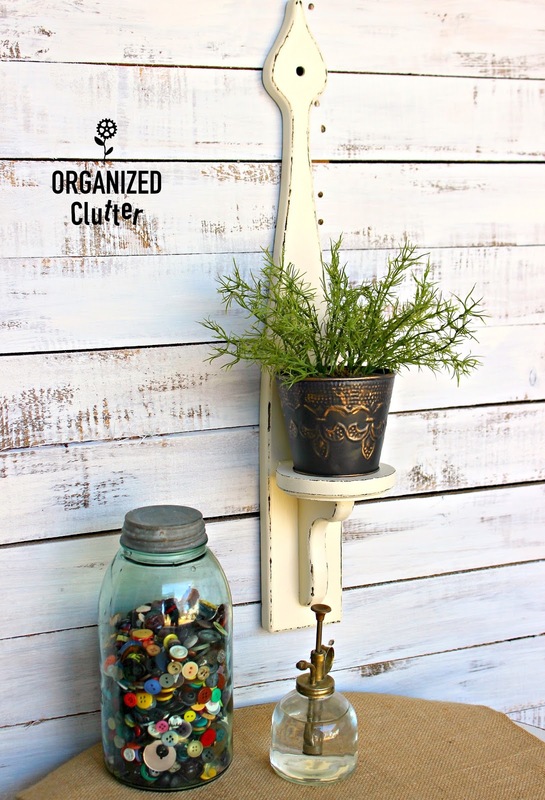 Super simple little makeover. I think the "IVY" label, doily, and sisal rope added much needed interest to the simple wooden box. Thrift shop item number two was this dark stained wooden candle sconce. 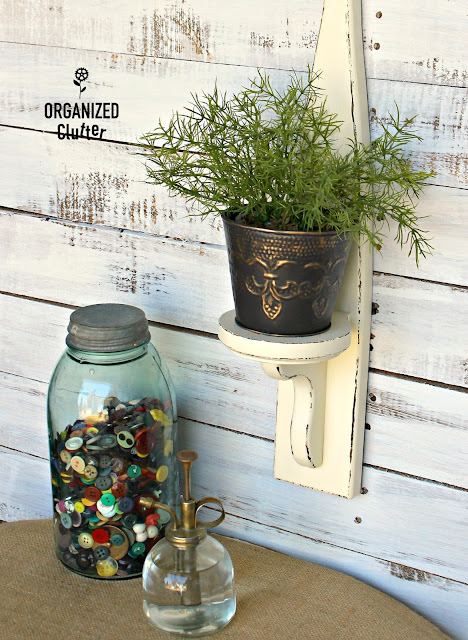 I removed the candle cup from the sconce, and then sprayed it with Rust-Oleum Zinsser 408 Bulls Eye Clear Shellac Spray 12 oz to prevent the stain from bleeding through my chalk paint. I also picked up this little metal flower pot at the thrift shop. I painted my sconce with One 30 Fl Oz Tintable Base RustOleum Chalked Chalk Ultra-matte Paint 287688 tinted in Chiffon Cream. 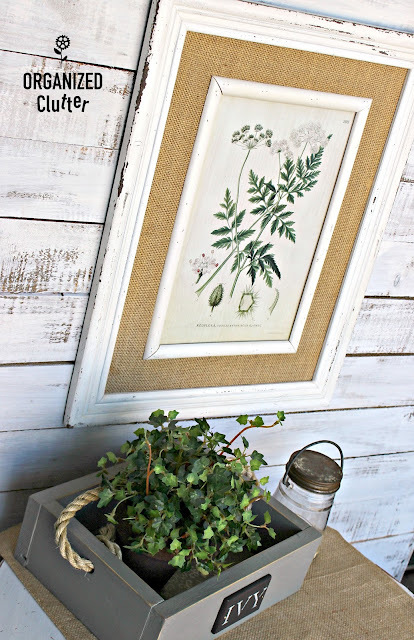 I like this chalk paint made by Rustoleum. I spray painted the green embossed flower pot with Rust-Oleum 302590 Chalked Spray Paint, 12 oz, Charcoal/Gray . I then rubbed on some gold accents to the raised sections of the pot with AMACO Rub 'n Buff Wax Metallic Finish, Antique Gold, 0.5-Fluid Ounce . Then I screwed the pot over the indented spot on the sconce being careful not to screw it in to tight to bend the bottom of the pot outward. I sealed my project with Krylon 51313 Satin Finish Crystal Clear Interior and Exterior Top Coat - 11 oz. Aerosol . I added some faux greenery to my metal pot. Very easy, one of a kind, inexpensive decor! You truly have a vision for your treasures!!! Awesome job!!! how did you fasten the magnet? I see some type of little rivets? I took the magnet off and nailed it! I guess I wasn't clear. Sorry. That country gray looks so good on that box! Amazing! Your revamps are ALWAYS darling, Carlene, but that box with the rope has stolen my ever lovin' junk heart. MUST MAKE!